It is the era of the crossover, and Buick currently has no midsize crossover. So it imported a wagon from Germany. It may not have that elevated ride height of vehicles such as the *alphanumeric nameplate* from *insert brand here*, but it’s far more practical. There’s virtually no compromise when it comes to storage space, at a commodious 73.5 cubic feet. And with the lower height than a crossover, the roof racks are far more accessible. The lower center of gravity also yields superior maneuverability. We’ll take both attributes over ride height any day of the week. And when it comes to what this imported wagon means for Buick, it could mean a strong conquest take rate. Because driving through the red-dusted landscape of Arizona, Buick showed shimmering signs of potential to be an American Volvo with the Regal TourX. It’s a unique vehicle on sale today – not just for Buick, and not just for GM – but for basically any brand on the market that has its founding roots in America. On dirt road sections of our route, it was easy to channel our inner Walter Röhrl in the German-built Regal TourX. It casually slides to and fro on the limited grip surface, as its twin-clutch AWD system predictably grabbed and skated around one bend of road before straightening out to do it all over again, leaving a cloud of red dust in its wake. The ubiquitous 250 hp, 295 lb-ft 2.0L LTG turbo-four generates propulsion without much roister, and serves as the only engine in the Regal TourX, that pairs with a mandatory AWD system and eight-speed automatic transmission. The engine is acceptably punchy down low, while minimizing weight on the nose. Combine that with the extra overhang and weight on the backside, and we’ve got ourselves a rather compliant and balanced package. We drove the Buick Regal Sportback just a over month ago, which is casually athletic as it stands. The Regal TourX might actually be more so. Though the incrementally higher ride contributes to nuanced pitches and rolls compared to the lower Regal Sportback, the added balance feels like it adds to more enjoyable vehicle dynamics. However, the LTG, even with stop/start, is beginning to show its age, yielding an EPA estimated 21 MPG city and 29 mpg highway, for a moderate 24 mpg combined. The twin-charged engine in the Volvo V60 Cross Country can achieve 27 mpg combined, while the Audi A4 Allroad is estimated at 25 mpg combined. It’s not just the fuel economy where the TourX is slightly lagging compared to its smaller competitors. While it stands out in terms of luggage capacity and chic design, Buick is arbitrarily withholding several modern content options in both Regal TourX and Regal Sportback for the more athletic, range-topping Regal GS, due to launch in the coming months. For instance: want a V6? Regal GS. Want vented front seats? Regal GS. Want 9-speed AWD? Regal GS. Want a HUD? Regal GS. Want a sport mode? Regal GS. This strategy could either be to keep the MSRP of the Regal TourX in a more attainable zone, or to protect the performance-oriented Regal GS. Or perhaps a combination of both reasons. Either way, we’ll give the Regal a chance to launch and see how the content strategy fans out. In regards to MSRP, the Regal TourX seems to adopt a “tweener” approach that’s been a GM pricing strategy staple. 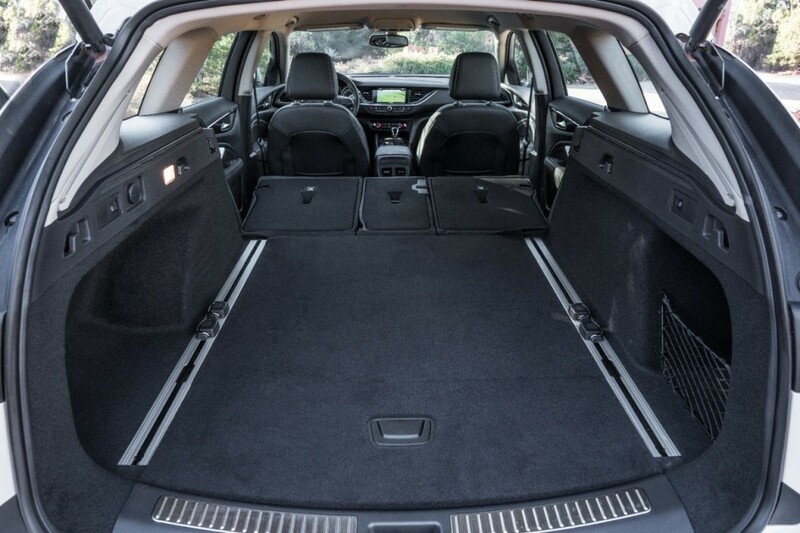 For the price of an Audi A4 Allroad, one can find themselves in a larger, top-trim Buick Regal TourX Essence, which came in around $42,400 for our tester, and enjoy roughly 15 cubic-feet more cargo space over the Quattro. Additionally, that means 30 cubic-feet more than a Volvo V60, and almost 20 cubic-feet more than a Volvo V90 Cross Country, which starts at over $52,000. Of course, there’s arguably more brand cache in the Volvo and Audi models, but hence the value proposition. 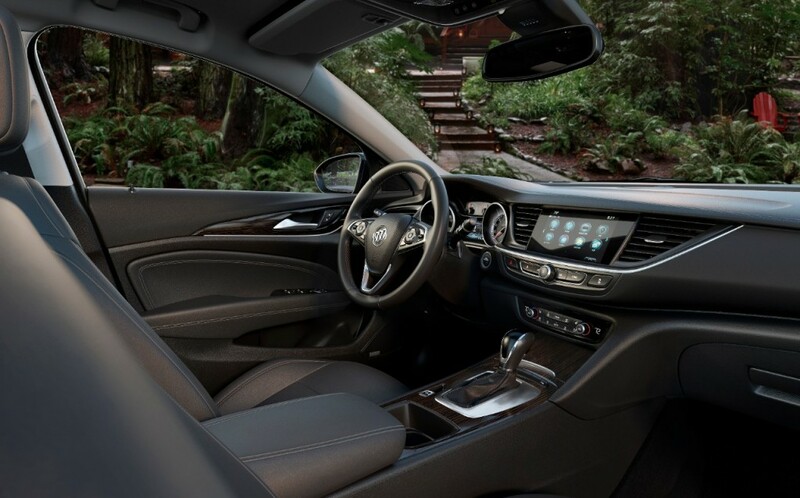 The interior in the 2018 Buick Regal TourX is much of the same in the front row as the Regal Sportback – which has its pros and cons. The likes of which can be studied in our first drive review of the Regal Sportback. However, the second row will enjoy the extra headroom, as the roofline is less sloped than the liftback version. Another facet of the Buick Regal TourX strategy is to “pick up the orphans,” as the marketing department puts it. Past or current owners of vehicles of the Cadillac CTS wagon, Saab 9-3 SportCombi, and even some left behind from the discontinuation of the Acura TSX wagon. It’s all a marketing priority for Buick and the Regal TourX, folding into the brand’s “white space” opportunism. Thirdly, the TourX offers a more contemporary and grown-up persona than, say, the Subaru Crosstrek or Outback. Though it’s more soft-road than off-road than the Outback. It’s not as tall as a Subaru Outback, which seems to have established a strong middle ground between wagon and crossover, and can therefore venture that much further into the rocky trails without much danger to the fenders or underbody. But where the Buick compensates for this is its refinement offered in relation to the Subaru inside, while offering it in a more grown-up package on the outside, and being a far better value than something from Audi or Volvo, at a more reasonable price. 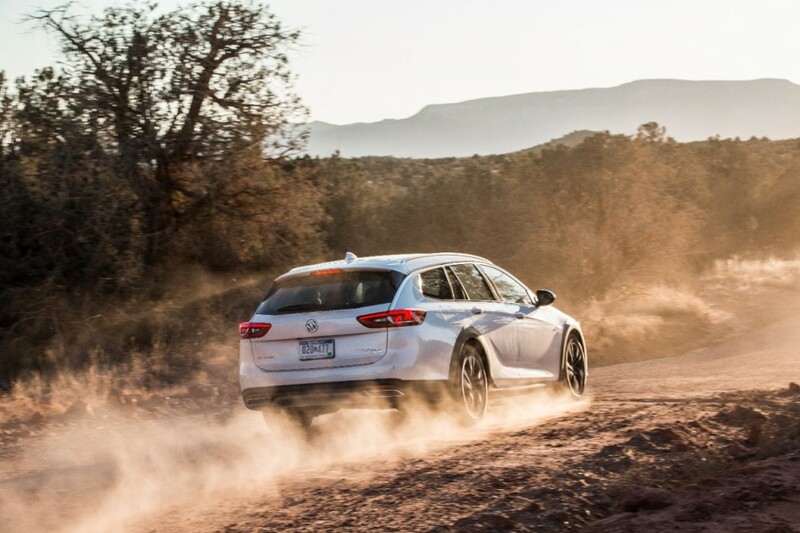 Moreover, the Buick Regal TourX is a vehicle that brings an awakened sense of adventure to what can be considered an otherwise mellow brand, and we hope that this is a direction that Buick takes in the future. Should make all-wheel drive an option on more vehicles. Wrong; Cascada is front-drive only. I wouldn’t trust anything from Made in China Volvo . 52 K for the smaller Volvo? I’ll take the Buick. Do you think they might? Envision is a compact. D2 platform = compact. So except nothing. White space. But I fear that as with most wagons it will find few buyers in America and few conquest as most wagon buyers are brand loyal. But let hope things do not play out as the have like the CTS and this one creates it’s own following. At least they are giving it a try. That is more than most would. And it looks better than an enclave… like most wagons look much better than most crossovers. I wish they had kept the Opel painted flares or make them optional. Opel Insignia Sports Tourer (wagon) has body-colored wheel arches that are not cladded. This car is a wagon equivalent of the Opel Insignia Grand Sport (what is called Buick Regal Sportback in North America). The Opel Insignia Country Tourer has cladded wheel arches and a higher ride height. That’s the Regal TourX. It’s not about the wheel wells or arches or cladding: it’s a modified package altogether. Buick has found a niche that some customers have hoped for . With a market full of CUV’s this is something different and will find a home for customers that are starting to tire of tall riding crossovers that are all starting to look alike . Kudos to Buick for taking a chance to sell a model in America where just the word wagon can kill a vehicles sales . If sales permit GM should drop the 3.6 under the hood , it shouldn’t raise the price much . The real question is why would anyone in their right mind buy this over the A4 Allroad? Short answer: a lower price. That’s about it. I like that woody idea! Does it have a chance Manoli? It certainly would be the most pragmatic choice for many buyers, however; most buyers do not buy based on practicality. I just don’t see this vehicle selling. Would like to be proven wrong. If they put ventilated seats and a HUD I would buy it right away. Station wagons aren’t going to make a comeback if the manufacturers actively discourage buyers by making them the ugly step sister. I’m going to buy an SUV because no one will give me modern features in a station wagon until you get up to the V90, which is a little beyond my range. I showed this to my friend who likes Buick station wagons from years past. The first thing he said was “I don’t like the ugly back plastic around the wheel wells”. I showed him the Opel variant that did not have them in the other thread and he liked that much better. I rest my case. GM can add the 2.0 CDTI BiTurbo of the insigna with an output of 206 hp and 354 lb-ft or 480 n-m or the 2.0 CDTI with 168 hp and 300 lb-ft. those engines can be fitted to the Malibu and Impala too.